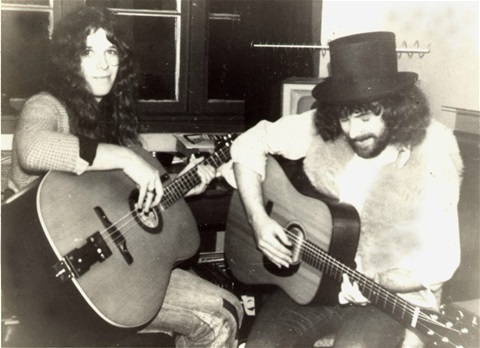 Zaine Griff (L) and Timberjack Donoghue (R) working on the songs for the Human Instinct's Hustler Album, Mt Eden, 1974. The Human Instinct's concept album, The Hustler, was an original "film noir" concept album set in the bootlegging days of the Prohibition Era. It has been described as the first Zaine Griff album and I think that's pretty close. It certainly stands as testament to Glenn Mikkleson's astonishingly rapid development as a songwriter. The distance of this development can be measured by comparing the track "Nothing's changed," his first ever songwriting attempt, to "Stoned Mary" the last track on the album. The "Film Noir" concept of the album is pure Zaine Griff too. That a teenager from Auckland's Western Suburb's should make his first steps into songwriting a sophisticated period-piece rock-opera, goes a long way to explaining Glenn's later international success as Zaine Griff. Inspired, I contributed two songs to the project. "Johnny Blade" is a character I plucked out of of one of Glenn's songs. Portrayed as an unlikeable homophobic Chicago gangster, Johnny Blade is the arch villian of the opera and I thought he deserved a voice. "Johnny Blade's" guitar riffs I created expressly for the twin guitars of the 1974 lineup of the Human Instinct and the song was great fun to play live. The song was later covered by Cockroach who also did a terrific live version of it. As lead guitarist in the band, I was soon nicknamed "Johnny Blade" and in certain parts of Northland the name has stuck to this day. "Gypsy Dream" was my other contribution to The Hustler. It is the tale of a young man approaching a Gypsy woman fortune teller who gives him a completely different set of answers to the ones he was expecting. (Don't we just looove that.!) The role of the young man in the operetic libretto was performed by Maurice Greer and I took the part of the Gypsy Woman. 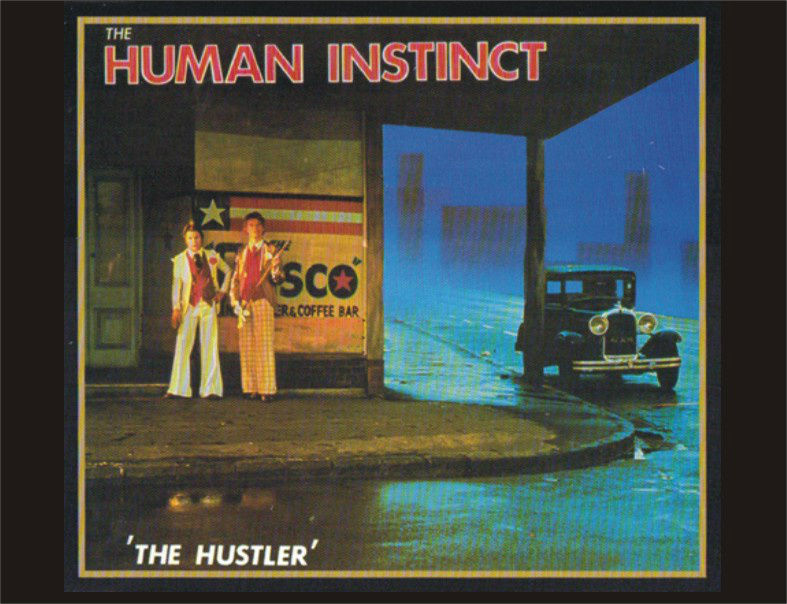 The Human Instinct released "Gypsy Dream" as an A-Side Single on the Zodiac label in 1974. The song was also later covered by both Cockroach and Electric Puha and in 1975 featured on the Timberjack Donoghue "Sea of Dreams" album. Looking back on The Hustler's ambitions as a rock opera, the project might have fared better artistically had it been trimmed down into a concept EP, as Wellington's Tom Thumb did, with their "Ludgate Hill" concept record. All that aside, for me personally, this album still represents two of the happiest years of my life, spent in one of the best bands I've ever played in. If I ever get depressed or feeling low, I'll play the title track of The Hustler at full volume which is guaranteed to blow any blues into the weeds, and Funky Monkey still remains one of my favourite twelve-bar grooves of all time. I've always dug the name- Human Instinct. There's something good and earthy about it. Something their music has always reflected. Live-the music they play is a good selection of original material and pop- with a spooky heavy flavour to it that makes it excellent to dance to. Lately the band has gone out on a limb and started their own private club, called Shanty Town, something refreshingly new on the dead local club scene. And then there was that incredibly funky rustic version of "Down The Hall On Saturday Night" that I caught one day up at Stebbings. The Instinct's music grew out of the heavy acid period of about five to seven years ago- the menacing bass riffs, the lead guitar about as melodic as a number seven dentist's drill. The moods about the same, but the music is a lot more mellow. 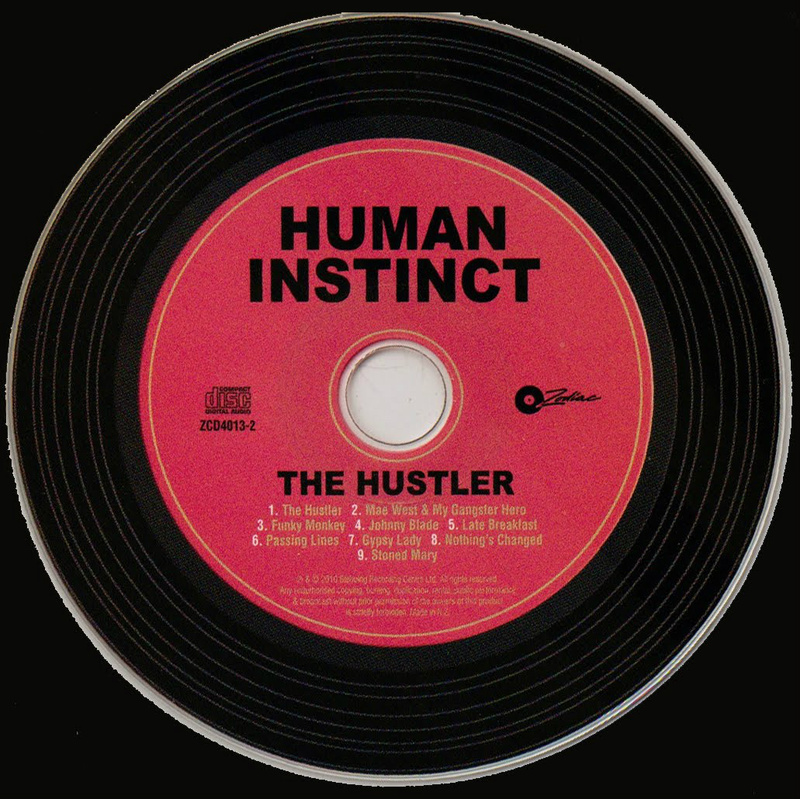 "The Hustler" is their second album for Zodiac and technically, musically, it's their best. The current line-up is Drummer / Leader Maurice Greer, and three guitars distributed between Martin Hope, Glen Mickelson and John Donoghue. In the latter two the Instinct has two very competent Songwriters. Glen Mikkleson wrote five of the albums nine tracks. They vary from good to very good, encompassing a variety of styles and moods. "Mae West and my Gangster Hero"has a definite Steely Dan feel to it. "Nothings Changed" is a simple country-style ballad and is probably Mikkleson's strongest lyrically. But "The Hustler's" real line honours go to Donoghue's two songs. "Johnny Blade" is pacey and mean. "Gonna see them fairies dance, I don't dig your hustlin' ways, you cant scare Johnny Blade" Snarls the Chicargo Torpedo Man. "Jeanne D'Arc didn't lie/ they told her she was mad/ but the truth was in her eyes coloured sad/` Alas these ancient eyes are growing weak/but what are the truths you wish to seek / from me cos to find them you will have to live inside my mind"
The production on The Hustler is by the Instinct themselves. Although it is first rate sometimes the songs cry out for a little thickening. But then again there is only so much drums and three guitars can accomplish, no matter how competently handled. The production, Suzi Pointon's photography, and the music make the "Hustler" one of the most original local; albums in recent months. Get into The "Hustler". It's good.